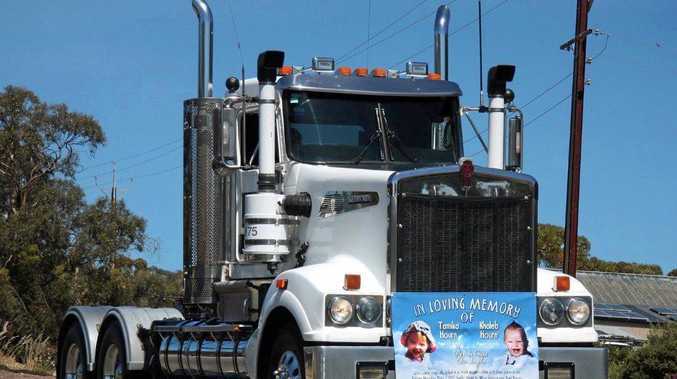 SIX years ago truckie Keith Wood, inspired by the memorial wall at Tarcutta where his father's name appeared, petitioned to build a memorial to remember South Australian truckies who had lost their lives while on the job. The memorial, which consists of two memorial walls - one for drivers who have been killed whilst doing their job and the second for those that had been in the industry but have retired or passed away from natural causes - was erected at the White Hill Parking Bay, where it still stands today. White Hill Truck Drivers Memorial secretary Sue Pepper said three years ago the committee voted to add two children's names to the memorials as the "guardians of the walls”. Tamika and Khaleb Hourn, who tragically lost their lives while travelling in a truck with parents Sharon and Darren in 1995, are depicted shooting an arrow over to each other. Sue said there was about 100-110 names on the memorial at the moment, with another 7-10 to be added during this year's memorial, to be held on Saturday, November 2 at 11am. The convoy will leave from BP Wingfield and BP Keith at 8.30am will travel to Murray Bridge, arriving just before the memorial begins. Sue said it would be "nice if we never have to put names on the wall” but the memorial was a great way to remember those "trucking brothers and sisters who pay the ultimate sacrifice doing the job they love”. A family fun day will be held after the memorial from 1pm and will include games for the children, food stalls, information booths and a show and shine. "There will be a fire truck for the kids to climb over and see what they're like,” Sue said. In addition to the fire truck, Keith said there would be a 'Tiny Truckies Trail' event similar to the Yellow Brick Road, where children could pick up some goodies. The fun day will also include raffles and a charity auction. Entry is by gold coin donation, or free for children.